Fathers were the disciples of the 12 apostles, the disciples of the disciples of the 12 apostles, the disciples of the disciples of the disciples of the 12 apostles, etc. In short they were the Christian leaders who took charge of the Church following the death of the 12 apostles. They were not only taught by the 12 apostles, they were also first-hand witnesses to the creation of the Church worldwide. 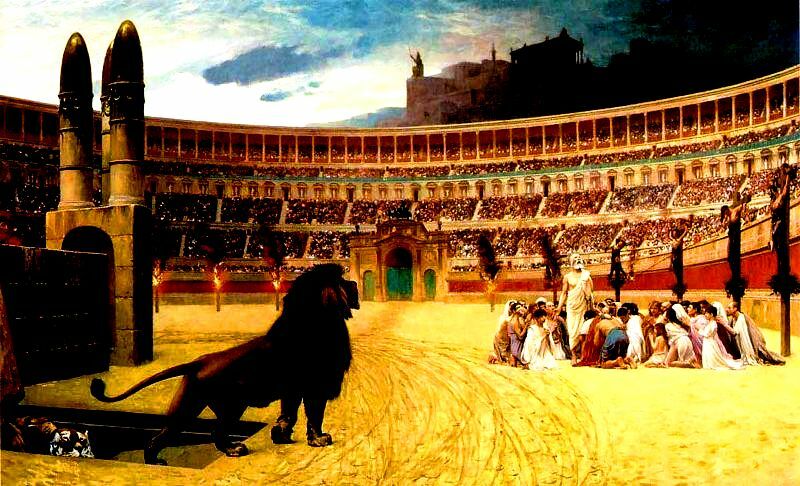 Most, if not all, were martyred by being crucified, beheaded, fed to the lions at the Roman Coliseum, boiled in oil, or skinned alive. They were the ones empowered by the Holy Spirit (John 16:13 and 1 John 4:6), and who personally handed on the oral teaching of Jesus Christ, before the New Testament canon was created by the Catholic Church in the late 4th century, at the councils of Rome, Hippo, and Carthage. One of the great early ones, St. Clement, is actually mentioned in the bible in Philippians 4:3. None of these early Church Fathers just stood up and started preaching on his own. They followed the Biblical model in Acts of “being sent” (Romans 10:15). Who sent them? Jesus sent the 12 apostles (“as the Father sent me, so I send you”). The 12 apostles then laid hands on others and sent them (Acts 6:6). This apostolic tradition has been followed for 2000 years by the Catholic Church, who continuously lays hands on new disciples in every generation since Jesus walked the earth, and then sends them to the four corners of the earth to preach the good news of Jesus Christ, to forgive sins in His Name, and to bring Jesus in the Eucharist to us all. We, the members of the 21rst Century, owe these early Church Fathers a lot of gratitude, because they died horrible deaths in order to preserve and to hand on the Word of God to us today. A lot of Protestants ignore these early Christian leaders, preferring instead to believe that the history of Christianity began with Jesus and the 12 apostles, and then somehow skipped over 15 centuries to Martin Luther. That would be like saying that the history of the United States began with George Washington in 1776, and then skipped over to Franklin Roosevelt in 1932. For some reason, a lot of Protestants will refuse to read any of the writings of the early Church Fathers, proudly proclaiming to everyone that “Those writings are not in my Bible!” But they will read the writings of Martin Luther, Billy Graham, and Max Lucado, even though those aren’t in the Bible either! They will even read and believe the heretical “Left Behind” books of LaHeye and Jenkins (there is no “secret” rapture of believers mentioned anywhere in the bible. When it happens, according to the bible, there will be trumpet blasts, and every eye will see Jesus). The writings of the early Church Fathers elucidate what is taught in the Bible, so that it’s no mystery whether or not the Eucharist is the actual body, blood, soul, and divinity of Jesus Christ, whether or not Mary is the new Eve, or whether or not there is a purgatory. After all, the early Church Fathers were taught by the 12 apostles, handed on the faith to the next generation, and were then martyred for their actions! Why someone would trust more in the writings of people coming along 15 centuries later over their writings is very strange indeed. Some of the greatest early Church Fathers are mentioned below. To read about them, just click on their name. To read about what they thought about the following issues, click on each one of the topics below. So don’t get trapped in the Protestant philosophy that actually says that if it isn’t in the Bible, then it can’t possibly be true. If that were truly the case, then none of Martin Luther’s writings can be seen as true, because they aren’t in the Bible either! Take the time to read what our Catholic martyred ancestors had to say. After all, we are all united through time and space in the Eucharist. St. John says in his gospel that if we eat the body of Christ and drink His blood, then Christ abides in us, and we in Him! And because we are all united in Christ, we are all united with each other. And once non-Catholic Christians start to read these writings of the early Church Fathers, they will soon discover that there were no Baptists, Lutherans, Methodists, Mormons, Episcopaleans, etc., anywhere in the Early Church. Those traditions of men were all started centuries later, based on what people thought Jesus’ Church was all about, rather than on what it actually was.